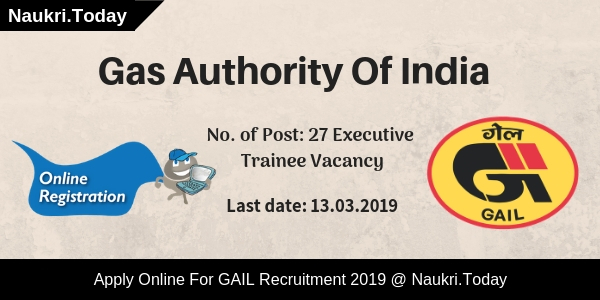 GAIL Recruitment 2019 Apply For 27 Executive Trainee Posts. 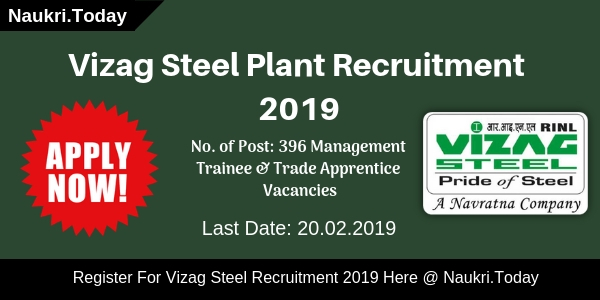 Hello Friends, Do you want to apply for GAIL Recruitment 2019? If yes then here is good news for you. Gas Authority of India has issued notification for 27 Executive Trainee Post. Participants who are interested can apply through online mode. Candidates can fill the application form for GAIL Executive Trainee Vacancy from 12.02.2019. Applicants must apply online for GAIL Jobs till 13.03.2019. For more details related to the selection process & eligibility criteria, participants can read the given below article carefully. What Documents Must Carry At Time Of Interview For GAIL Executive Trainee Jobs 2019? Is It Necessary To Send Hard Copy Of GAIL Executive Trainee Vacancy Application Form 2019? What Is The Process of Selection for GAIL Recruitment? What Are The Important Dates For GAIL Foreman Jobs 2018? Required Education Qualification For GAIL Executive Trainee Jobs 2019 Bachelor’s Degree in Engineering with minimum 65% marks. Participants should carry some documents at the time of interview which are given below. All the documents must be self-attested. There are many benefits will be provided to the candidates who are selected for GAIL Executive Trainee Recruitment 2019. No, it is not necessary to send hard copy of registration form to the department. Participants only need to fill application form & submit online for GAIL Jobs 2019. For more details applicants must read the GAIL India Jobs Notification 2019. Conclusion: Gas Authority Of India is inviting applications for 27 Executive Trainee Post. Interested participants should fill online application form for GAIL Recruitment 2019. Candidates can apply online for GAIL Executive Trainee Vacancy till 13.03.2019. Are you looking for GAIL Recruitment 2018? If yes, Here is a good news for you. Gas Authority of India Limited has released notification for filling up 176 Sr. Engineer, Sr. Officer, and Other Vacancies. Candidates should check here eligibility criteria for GAIL Senior Engineer Jobs 2018. Online Registration has been started from 12 December 2018. Interested and Eligible aspirants may fill up their application form before the last date 31 December 2018. Participants who have some experience can apply for GAIL Vacancy 2018. For further details regarding application fee and pay scale read below article carefully. Closing Date To Apply online For GAIL Senior Engineer Recruitment: 31 December 2018 till 06:00 P.M. Participants may check here qualification, age, and application fee for Gas Authority of India Jobs 2018. Eligible candidates may fill up their application form before the last date. Candidates may fill up all the details carefully in an application form. Candidates must have Bachelor Degree in Engineering in relevant field for GAIL Vacancy 2018. Applicants who have experience in their field according to The department requirement are eligible for GAIL Recruitment 2018. For more details, aspirants should read official GAIL Notification 2018-19 carefully. The Department has set a particular age limit for all Posts. Before apply on any posts candidates should check here age limit for GAIL Senior Engineer Vacancy 2018. Here we provided you links to download Notification further more information. 15 years for PWD‐SC/ ST category candidates. Applicants of General and OBC category have to pay Rs. 200 as an application fee for GAIL Recruitment 2018. The Department may exempt SC/ST/and PWD category applicants for the payment of an application fee. Participants may pay their application fee through Online modes such as Credit Card, Debit Card, and Internet Banking. Candidates may download GAIL Notification either from here or from the official website. The Department should pay a good amount of salary to the selected candidates. Here we provided you table which shows you information regarding Gas Authority of India Jobs 2018. The Department will select candidates on the basis of Group Discussion and Interview. Firstly candidates should participate in group discussion. A group discussion should be conducted by the experts. Candidates who qualify in group discussion will call for Personal Interview for GAIL Vacancy 2018. Applicants should follow these steps to apply for GAIL India Vacancy 2018. Before applying candidates should check here qualification, age, and much more for GAIL Recruitment 2018. Participants should log on to official Website of Gas Authority of India i.e gailindia.com. After that Open Careers Section at Homepage page. Now click on applying for Gail option. All GAIL recruitment PDF will be shown on your computer screen. Now click on Senior Engineer Notification Advt. PDF. Pay your application fee after rechecking your form. Conclusion: Gas Authority of India has issued notification for 176 Senior Engineer, Senior Officer and other Posts. Candidates may apply online for GAIL Recruitment 2018 from here. Participants may collect here eligibility criteria form above section. GAIL Recruitment 2018 – Gas Authority of India Limited has declared notification for recruiting candidates on Foreman, Junior Engineer, Technician, and Other Vacancies. Interested Applicants should check here qualification, age, and selection criteria for Various posts. Online Registration for 160 GAIL Vacancies has started form 14 November 2018. Candidates must fill up their application form before the last date 30 November 2018. Participants may also required experience to apply for GAIL JE Jobs 2018. For further more information read below article carefully. Candidates who are participating in GAIL India Jobs 2018 must check here qualification, age, application fee before applying. Participants must fill up their application form carefully before otherwise, their form will be rejected. Applicants may also check official GAIL Notification for further more details. Junior Engineer (Chemical) Diploma in Engineering in Chemical/ Petrochemical/ Chemical Technology/Petrochemical Technology with minimum 55% marks for ST Candidates. 08 years Post Qualification Experience in line in Chemical discipline in supervisory capacity in State/ Central Government Department(s)/ Institution(s)/ Undertaking(s) and/or Large Private Sector Organization(s)/ Institution(s)/ Company (ies) of repute as an employee of that Plant/ Undertaking/Organisation. Foreman (Electrical) Diploma in Engineering in Electrical / Electrical & Electronics with minimum 60% marks [Candidates applying for UR & OBC (NCL) post] Minimum 02 (Two) years post qualification experience in line in Electrical discipline in Power/ Steel/ Cross Country Hydrocarbon Pipelines/ Hydrocarbon Process Plants (i.e. Refinery, Petrochemicals and Fertilizer plants only) of a State/ Central Government Undertaking(s) and/or Large Private Sector Organization(s)/ Company/ Institution of repute, as an employee of that Plant/ Undertaking/ Organisation. Foreman (Instrumentation) Diploma in Engineering in Instrumentation/ Instru mentation & Control/ Electronics & Instrumentation / Electrical & Instrumentation/ Electronics/ Electrical & Electronics with minimum 60% marks [Candidates applying for UR & OBC (NCL) post] Minimum 02 (Two) years post qualification experience in line in Instrumentation discipline in Power/ Steel/ Cross Country Hydrocarbon Pipelines/ Hydrocarbon Process Plants (i.e. Refinery, Petrochemicals and Fertilizer plants only) of a State/ Central Government Undertaking(s) and/or Large Private Sector Organization(s) of repute, as an employee of that Plant/ Undertaking/ Organisation. Foreman (Mechanical) Diploma in Engineering in Mechanical / Production/ Production & Industrial/ Manufacturing/ Mechanical & Automobile with minimum 60% marks [Candidates applying for UR & OBC (NCL) post] Minimum 02 (Two) years post qualification experience in line in Mechanical discipline in Power/ Steel/ Cross Country Hydrocarbon Pipelines/ Hydrocarbon Process Plants (i.e. Refinery, Petrochemicals and Fertilizer plants only) of a State/ Central Government Undertaking(s) and/or Large Private Sector Organization(s) of repute, as an employee of that Plant/ Undertaking/ Organisation. Foreman (Civil) Diploma in Engineering in Civil with minimum 60% marks [Candidates applying for UR & OBC (NCL) post] Minimum 02 (Two) years of postqualification experience in line in Civil discipline in State/ Central Government Department(s)/ Institution(s)/ Undertaking(s) and/ or Large Private Sector Organization(s)/ Institution(s)/ Company(ies) of repute as an employee of that Plant/Undertaking/Organisation. Junior Chemist Full-time Master Degree (M.Sc.) in Chemistry of minimum 02 years duration with minimum 55 % marks [Candidates applying for UR & OBC (NCL) post] Minimum 2 (Two) years Post qualification experience in line in Quality Control Laboratory of an organization in the Hydrocarbon Industry like Oil Refineries, Gas Processing Process Plants, Petrochemical Plants or Fertilizer, steel, Chemical or other relevant process industries of repute as an employee of that Plant/ Undertaking/ Organisation. Junior Superintendent (Official Language) Full-time Bachelor Degree of minimum 03 years duration in Hindi Literature with minimum 55% marks [Candidates applying for UR & OBC (NCL) post] and Should have English as one of the subjects in Graduation. Minimum 03 (Three) years Post Qualification experience in line in English to Hindi translation and vice-versa of various reports, documents, letters etc., preferably State/ Central Government/Public Sector Undertakings/ Banks/ Financial Institutions of repute as an employee of that Plant/ Undertaking/ Organisation. Junior Superintendent (HR) Full-time Bachelor Degree of minimum 03 years duration with minimum 55% marks [Candidates applying for UR & OBC (NCL) post] and Diploma in Personnel Management/ Industrial Relations with minimum 55% marks [Candidates applying for UR & OBC (NCL) post] Minimum 02 (Two) years Post Qualification Experience in Personnel & Administration/ HR Department in State/ Central Government Department(s)/ Organisation(s)/ Undertaking(s) and/ or Large private sector Organisation(s)/ Institution(s)/ Company(ies) of repute as an employee of that Plant/ Undertaking/ Organisation. Technician (Mechanical) Matric plus ITI Tradesman ship/ National Apprenticeship Certificate in fitter / diesel mechanic / machinist / turner trade. Minimum 02 (Two) years post qualification experience in line in mechanical discipline in Power/ Steel/ Cross Country Hydrocarbon Pipelines/ Hydrocarbon Process Plants (i.e. Refinery, Petrochemicals and Fertilizer plants only in State/Central Govt. Department/ Organization(s)/ Undertaking(s) and/or Large Private Sector Organization(s)/ Institution(s)/ Company (ies) of repute. Technician (Instrumentation) Matric plus ITI Tradesman ship/ National Apprenticeship Certificate in Instrumentation Trade. Minimum 02 (Two) years post qualification experience in line in instrumentation discipline in Power/ Steel/ Cross Country Hydrocarbon Pipelines/ Hydrocarbon Process Plants (i.e. Refinery, Petrochemicals and Fertilizer plants only in State/Central Govt. Department/ Organization(s)/ Undertaking(s) and/or Large Private Sector Organization(s)/ Institution(s)/ Company (ies) of repute. Technician Electrical Matric plus ITI Tradesman ship/ National Apprenticeship Certificate in Electrical/ wireman Trade. Minimum 02 (Two) years post qualification experience in line in electrical discipline in Power/ Steel/ Cross Country Hydrocarbon Pipelines/ Hydrocarbon Process Plants (i.e. Refinery, Petrochemicals and Fertilizer plants only in State/ Central Govt. Department/ Organization(s)/ Undertaking(s) and/or Large Private Sector Organization(s)/ Institution(s)/ Company (ies) of repute. Technician – Telecom & Telemetry Matric plus ITI Tradesman ship/ National Apprenticeship Certificate in Electronics/ Telecommunication trade Minimum 02 (Two) years post qualification experience in line in Process Plants in the area of Plant communication system and SCADA/ DCS of a State/ Central Government Undertaking(s) and/or Large Private Sector Organization(s), of repute. Assistant (Stores & Purchase) Full-time Bachelor Degree of minimum 03 years duration with minimum 55% marks [Candidates applying for UR & OBC (NCL) post] Minimum 1 (One) year Post Qualification Experience in line in the Stores/Contract & Procurement/ Materials Management Department in State/Central Govt. Department/ Organization(s)/ Undertaking(s) and/or Large Private Sector Organization(s)/ Institution(s)/ Company (ies) of repute. 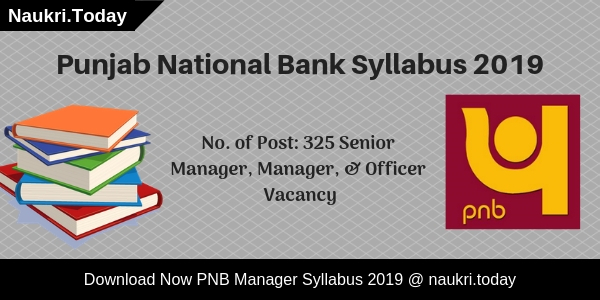 Accounts Assistant Full-time Bachelor Degree of minimum 03 years duration in Commerce (B. Com) with minimum 55% marks [Candidates applying for UR & OBC (NCL) post] Minimum 1 (One) year Post Qualification Experience in line in Finance/ Accounts Department in State/ Central Govt. Department/ Organization(s)/ Undertaking(s) and/or Large Private sector Organization (s)/ Institution(s)/ Company (ies) of repute. Marketing Assistant Full-time Bachelor Degree of minimum 03 years duration in Business Administration (BBA/ BBS/ BBM) with minimum 55% marks [Candidates applying for UR & OBC (NCL) post] Minimum 1 (One) year Post Qualification Experience in Sales/ Marketing in State/ Central Govt. Department/ Organization (s)/ Undertaking(s) and/or Large Private Sector Organization/ Institution(s)/ Company (ies) of repute. Assistant (HR) Full-time Bachelor Degree of minimum 03 years duration with minimum 55% marks for UR & OBC (NCL) category candidates. Minimum 1 (One) year Post Qualification Experience in HR functions in State/ Central Govt. Department/ Organization (s)/ Undertaking(s) and/or Large Private Sector Organization/ Institution(s)/ Company (ies) of repute. The Department has set age limit according to Grade given in Vacancy Table. For Grade S-5 upper age limited is 28 years, For Grade S-3 is 26 years, and For Grade S-7 is 45 years for 160 GAIL Vacancy 2018. The Department may also provided age relaxation to SC/ST/OBC category candidates. Participants may also read official GAIL Notification for more information. Here we gave you links to download GAIL Foreman Jobs notification. Candidates who belong to General and OBC Category should pay Rs. 50 as an application Fee for GAIL Foreman Jobs 2018. Here we gave you links to apply for GAIL Jobs 2018. Candidates can pay their fee through online mode as well as offline mode. Participants can pay their application fee through Net Banking of any Nationalist/ Private Banks. Candidates may also allow to use their cards for the submission of Examination Fee for GAIL Recruitment 2018. Gas Authority of India Limited’s selection process is very difficult. The Department will conduct so many exam before appointing candidates on Various posts. Now The Department has organize written examination/Trade Test/ Skill Test/ Computer Proficiency Test/ and Translation test. Participants who qualify in these test will get select for GAIL Jobs 2018. Candidates may download GAIL Notification 2018 either from here or from official website. Here we provided you links to apply for GAIL JE Vacancy 2018. Participants who get selected for GAIL Recruitment 2018 will get good amount of salary. Here we gave you grade wise salary for Different Posts. Applicants should follow these steps to apply for GAIL Foreman Jobs 2018. Candidates must read official notification of GAIL Recruitment 2018 for more detailed information. Log on to official website of GAIL India Limited i.e gailonline.com. After that Click on Carrere section at Homepage. Now Click on Advt. PDF. Read Complete GAIL Recruitment Notification carefully. Pay your an application fee. Candidates must keep one copy of application form with them for feature use. Conclusion: GAIL India Limited has issued notification for 160 JE, Technician, Foreman, and Other Posts. Check Here eligibility criteria for GAIL Recruitment 2018. Here we provided you links to apply for GAIL Vacancy 2018.